DIE Veneris, videlicet, 8 die Julii. To be communicated to the H. C. and to the French Ambassador. Baron Henden Leave to be absent. and about Mr. Whetcomb's Order, and the Amendments. Mr. Hastings and others sent for. Gregory, Under Sheriff of Leicester, to put in Bail. Message to the H. C. that the Lord Mayor is ready to put in his Answer. Mr. Agar, Deputy Clerk of the Crown, to bring in a Letter from York. Message from the H. C. with the Order for 2000 Men for Hull, and the Captains Commission. Letter from Secretary Nicholas, that O Neale is going for Ireland, with Arms from Flanders. Ordnance to be sent to Ireland. Message from the H. C. about communicating Sir Tho. Roe's Letter to the French Ambassador. Two Lords to communicate it to him. Message to the H. C. that Two Lords are added to the Committee of Safety. Answer from the H. C. about the Lord Mayor. Ordered to call a Common Council Tomorrow Morning. He will call a Common council Tomorrow Morning. Message to the H. C. that the Lord Mayor's Cause will be heard on Monday. The Impeachment of Mr. Hastings, &c.
The Lord Mayor's Answer to the Impeachment of the H. C.
Justice Foster to go the Circuit. Declaration of Herefordshire; to be sent down, to know if the County will own it. Printer, &c. of it to be attached. and for Indemnity to the Kentish Voluntiers. Message to the H. C. for a Conference on a Declaration of Kent. Message from the H. C. with an Order for Assistants to put the Leicester Militia into Execution. Order for Levy-money, for raising Troops for Ireland. Intelligence from York, of Commissions to raise Troops. Message from the H. C. with Votes. Officers to train the Horse in Bucks. Lord Cranborne, Lord Lieutenant of Hertford and Dorsetshire. County of Bucks to detain One Thousand Pounds for Horse Arms. Boston and Lynne Customers to allow Provisions to go from thence to Hull. Order for Indemnity of the Ashford Men in Kent. The Earl of Holland acquainted this House, "That he hath received a Letter from Sir Tho. Roe, Ambassador at Vienna, to clear himself from the Information of the French Ambassador, that he should offer to the King of Hungary Conditions of an offensive and defensive League with the House of Austria, for the Recovery of the Palatinate." The House thought fit to communicate this to the House of Commons, at a Conference; and then to let the French Ambassador understand, that Sir Tho. Rowe denies (fn. 1) what he charged him with. To desire a Conference, concerning a Letter from Sir Tho. Rowe. Upon the Report of Baron Henden; it is Ordered, That Three of those Persons complained of shall be sent for, as Delinquents. Ordered, That Mr. Baron Henden shall have Liberty to go to his own House after the Circuit is ended, and there to stay until the next Term. The Lord Kymbolton reported the Conference Yesterday with the House of Commons; which was, "That the House of Commons have brought to their Lordships an Impeachment against Mr. Henry Hastinges, Sir Rich. Hawford, Sir Jo. Bale, and Jo. Pate, of High Crimes and Misdemeanors; in which Impeachment, the House of Commons desires their Lordships to give Expedition therein. "2. Whereas the House of Commons received from their Lordships an Order concerning Trystram Whetcombe, wherein their Lordships do desire that some Alterations be (fn. 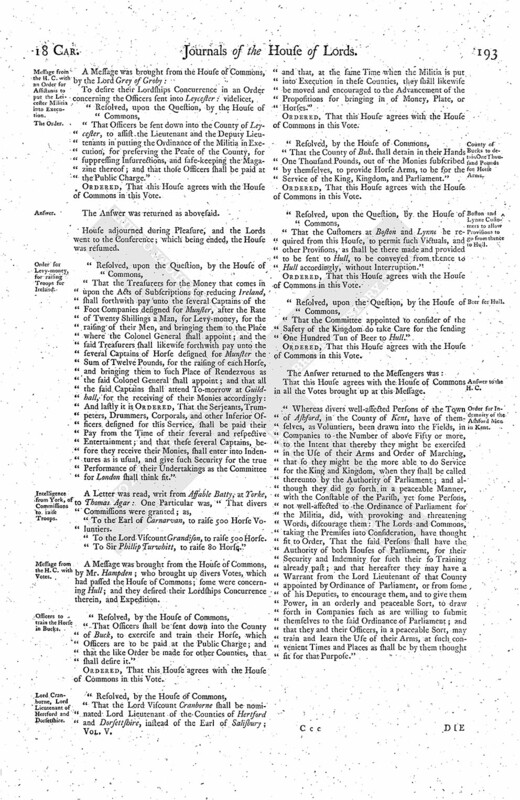 2) made therein; as, Linea 1a, the Words ["and Commons"] to be left out; and Linea 2 a, after the Word ["Information"], and before the Word ["that"], insert ["from the House of Commons"]; and in Linea 16a, the Words ["and Commons"] to be left out. "The House of Commons agree to the First Amendments, but not to the rest, but desire it may pass as it came from them; for the Letter of Tristram Whetcombe was sent to a Friend of his in London, and by him communicated to them: Upon this all the Proceedings came; which the House of Commons hold to be a Breach of the Privilege of their House, as well (fn. 3) as of their Lordships, in Proceedings against the said Whetcombe; therefore the House of Commons desire a Vindication of their Privileges so broken; and that the Words ["and Commons"] may stand. Ordered, That Mr. Hastinges, Sir Richard Hawford, Sir Jo. Bale, and Mr. Pate, shall appear before this House To-morrow Sevennight, to hear this Impeachment read; and that they shall put in their several Answers to the same the Thursday following. Upon the Petition of Anne Moyle, a poor Irishwoman; (fn. 3) she shall have Five Pounds paid by the Clerk of the Crown out of the Contribution-money for the Relief of poor Irish. Upon the humble Petition of Wm. Gregory, Under Sheriff of Leycestershire; it is Ordered, That he shall put in sufficient Bail of Two Thousand Pounds, to appear here upon Three Days Notice given to him. A Message was sent down to the House of Commons, by Sir Edw. Leech and Mr. Dr. Ayloffe. To let them know, that the Lord Mayor is ready to put in his Answer. Upon Information to the House, "That Mr. Agar, Deputy Clerk to the Clerk of the Crown, hath received a Letter, from Yorke, to make Writs for a Commission to raise Horses;" it is Ordered, That Mr. Agar shall bring this Letter to this House this Afternoon. Ordered, That the Lord North and the Lord Robartes shall be added to the Committee of Five for the Defence of the Kingdom. 1. Concerning the Two Thousand Men to be sent to Hull. 2. Concerning the Commission to be given to the Captains. But this House declares, That whereas the Captains, in this Order, have Power to make Choice of their Under Officers, it is intended to be admitted but for this urgent Occasion, and not to be drawn into Precedent hereafter. That this House approves of the Amendments in these Two Orders. A Letter written to the Lord Lieutenant of Ireland, from Mr. Secretary Nicholas, was read, dated at Yorke, 5 Julii, "That Owen O Neale is going for Ireland, with Five Hundred Pair of Arms, from Flanders." "The Earl of Northumberland acquainted this House, That he had given Order to the Ships at Sea, for the staying of him, at least Three Weeks ago; and his Lordship sent to stay him at Dunkerke, but he was gone the Day before." And the Lord Lieutenant was to signify so much to the Secretary from this House. Ordered, That the Commissioners for the Irish Affairs do take Care that the Ammunition and Ordnance be sent into Ireland, according to a List sent to the Lord Lieutenant from the King, and approved of by both Houses. To let their Lordships know, that they agree with their Lordships in Opinion of communicating the Effect of Sir Tho. Rowe's Letter to the French Ambassador; but refer it to their Lordships in what Manner it shall be. Ordered, That the Earl of Holland and the Lord Newneham shall acquaint the French Ambassador with the Sense of the Letter, that it is wholly disavowed, that there was no such Instructions from the King nor the Parliament to Sir Tho. Rowe; and he doth disavow it. To let them know that this House have added Two Lords more to the Committee for the Safety and Defence of the Kingdom. That the House of Commons will send up some of their House, to hear the Lord Mayor's Answer to the Impeachment. The Lord Mayor (fn. 4) was called in, to give an Account why he hath not called a Common Council, according to the Order of this House. He said, "He hath such great Occasions at the Sessions House where they have a great Gaol; and at such short (fn. 5) Notice, the Sessions cannot be adjourned; but he will call one as soon as conveniently he can." He withdrew; and the House being not satisfied with this Answer, Ordered, That the Lord Mayor shall call a Common Council To-morrow, at Eight a Clock. He being called in; the Speaker told him, "That this House is not satisfied with his Answer of putting it upon his Conveniency; therefore do expect that he shall call a Common Council To-morrow Morning, at Eight a Clock, without further Delay." 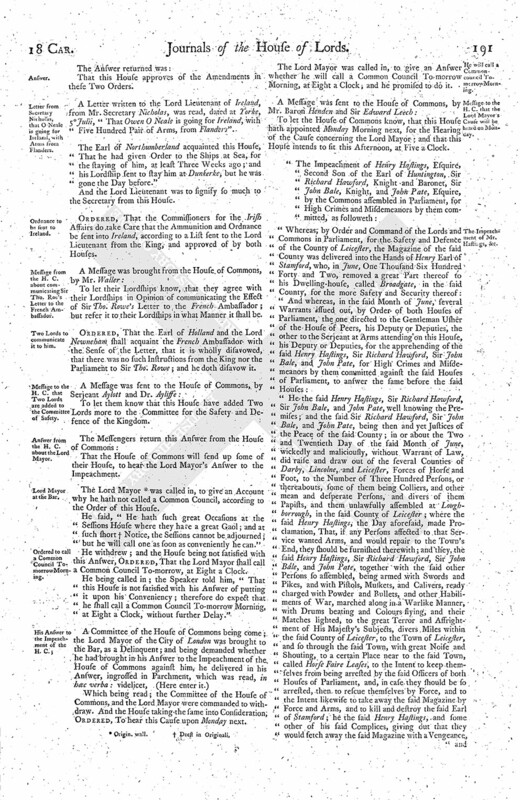 Which being read; the Committee of the House of Commons, and the Lord Mayor were commanded to withdraw. And the House taking the same into Consideration, Ordered, To hear this Cause upon Monday next. The Lord Mayor was called in, to give an Answer whether he will call a Common Council To-morrow Morning, at Eight a Clock; and he promised to do it. To let the House of Commons know, that this House hath appointed Monday Morning next, for the Hearing of the Cause concerning the Lord Mayor; and that this House intends to sit this Afternoon, at Five a Clock. "Wherefore the said Commons do, in the Name of themselves and of all the Commons of England, impeach the said Henry Hastings, Sir Richard Hawford, Sir John Bale, and John Pate, of the said several High Crimes and Misdemeanors. "And the said Commons, by Protestation, saving to themselves now, and at all Times hereafter, the Liberty of exhibiting of any other Accusation or Impeachment against the said Henry Hastings, Sir Richard Hawford, Sir John Bale, and John Pate, or any of them, and of replying to the Answers which they, or any of them, shall make, or of offering any Proofs of the Premises, or any of them, or of any other Accusation or Impeachment against them, or any of them, as the Case, according to the Course of Justice, shall require; do pray, that he the said Henry Hastings, Sir Richard Hawford, Sir John Bale, and John Pate, and every of them, may be forthwith put to answer the Premises, in Presence of the Commons; and that such Proceedings, Examinations, Trials, and Judgements, may be upon them, and every of them, had and used, as shall be agreeable to Law and Justice." "The humble Answer of Sir Richard Gurney, Knight and Baronet, Lord Mayor of the City of London, to an Impeachment against him, exhibited by the Honourable House of Commons, in this present Parliament assembled, the Fifth Day of this Instant July. 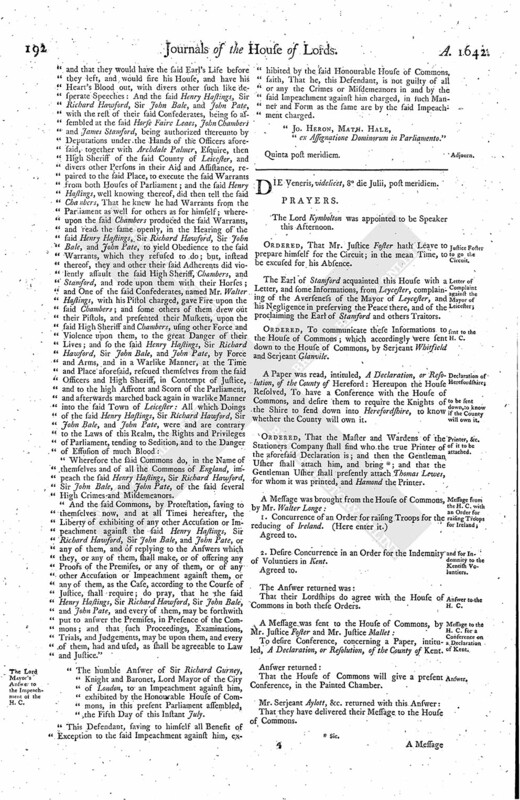 "This Defendant, saving to himself all Benefit of Exception to the said Impeachment against him, exhibited by the said Honourable House of Commons, saith, That he, this Defendant, is not guilty of all or any the Crimes or Misdemeanors in and by the said Impeachment against him charged, in such Manner and Form as the same are by the said Impeachment charged. ex Assignatione Dominorum in Parliamento." The Lord Kymbolton was appointed to be Speaker this Afternoon. Ordered, That Mr. Justice Foster hath Leave to prepare himself for the Circuit; in the mean Time, to be excused for his Absence. The Earl of Stamford acquainted this House with a Letter, and some Informations, from Leycester, complaining of the Averseness of the Mayor of Leycester, and his Negligence in preserving the Peace there, and of the proclaiming the Earl of Stamford and others Traitors. Ordered, To communicate these Informations to the House of Commons; which accordingly were sent down to the House of Commons, by Serjeant Whitfield and Serjeant Glanvile. A Paper was read, intituled, A Declaration, or Resolution, of the County of Hereford: Hereupon the House Resolved, To have a Conference with the House of Commons, and desire them to require the Knights of the Shire to send down into Herefordshire, to know whether the County will own it. Ordered, That the Master and Wardens of the Stationers Company shall find who the true Printer of the aforesaid Declaration is; and then the Gentleman Usher shall attach him, and bring (fn. 6); and that the Gentleman Usher shall presently attach Thomas Lewes, for whom it was printed, and Hamond the Printer. 2. Desire Concurrence in an Order for the Indemnity of Voluntiers in Kent. That their Lordships do agree with the House of Commons in both these Orders. To desire Conference, concerning a Paper, intituled, A Declaration, or Resolution, of the County of Kent. That the House of Commons will give a present Conference, in the Painted Chamber. "That Officers be sent down into the County of Leycester, to assist the Lieutenant and the Deputy Lieutenants in putting the Ordinance of the Militia in Execution, for preserving the Peace of the County, for suppressing Insurrections, and safe-keeping the Magazine thereof; and that those Officers shall be paid at the Public Charge." 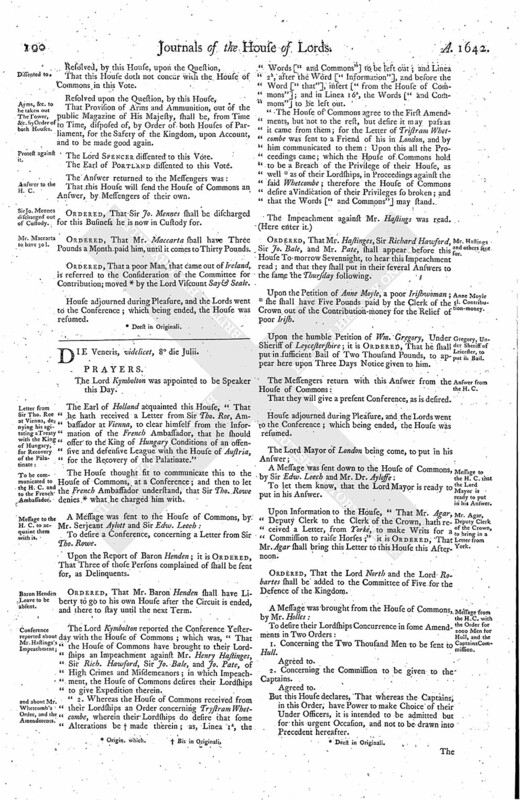 "That the Treasurers for the Money that comes in upon the Acts of Subscriptions for reducing Ireland, shall forthwith pay unto the several Captains of the Foot Companies designed for Munster, after the Rate of Twenty Shillings a Man, for Levy-money, for the raising of their Men, and bringing them to the Place where the Colonel General shall appoint; and the said Treasurers shall likewise forthwith pay unto the several Captains of Horse designed for Munster the Sum of Twelve Pounds, for the raising of each Horse, and bringing them to such Place of Rendezvous as the said Colonel General shall appoint; and that all the said Captains shall attend To-morrow at Guildhall, for the receiving of their Monies accordingly: And lastly it is Ordered, That the Serjeants, Trumpeters, Drummers, Corporals, and other Inferior Officers designed for this Service, shall be paid their Pay from the Time of their several and respective Entertainment; and that these several Captains, before they receive their Monies, shall enter into Indentures as is usual, and give such Security for the true Performance of their Undertakings as the Committee for London shall think fit." "To the Earl of Carnarvan, to raise 500 Horse Voluntiers. "To the Lord Viscount Grandison, to raise 500 Horse. "To Sir Phillip Turwhitt, to raise 80 Horse." A Message was brought from the House of Commons, by Mr. Hampden; who brought up divers Votes, which had passed the House of Commons; some were concerning Hull; and they desired their Lordships Concurrence therein, and Expedition. "That Officers shall be sent down into the County of Buck, to exercise and train their Horse, which Officers are to be paid at the Public Charge; and that the like Order be made for other Counties, that shall desire it." "That the Lord Viscount Cranborne shall be nominated Lord Lieutenant of the Counties of Hertford and Dorsettshire, instead of the Earl of Salisbury; and that, at the same Time when the Militia is put into Execution in these Counties, they shall likewise be moved and encouraged to the Advancement of the Propositions for bringing in of Money, Plate, or Horses." "That the County of Buk. shall detain in their Hands One Thousand Pounds, out of the Monies subscribed by themselves, to provide Horse Arms, to be for the Service of the King, Kingdom, and Parliament." "That the Customers at Boston and Lynne be required from this House, to permit such Victuals, and other Provisions, as shall be there made and provided to be sent to Hull, to be conveyed from thence to Hull accordingly, without Interruption." "That the Committee appointed to consider of the Safety of the Kingdom do take Care for the sending One Hundred Tun of Beer to Hull." That this House agrees with the House of Commons in all the Votes brought up at this Message. "Whereas divers well-affected Persons of the Town of Ashford, in the County of Kent, have of themselves, as Voluntiers, been drawn into the Fields, in Companies to the Number of above Fifty or more, to the Intent that thereby they might be exercised in the Use of their Arms and Order of Marching, that so they might be the more able to do Service for the King and Kingdom, when they shall be called thereunto by the Authority of Parliament; and although they did go forth in a peaceable Manner, with the Constable of the Parish, yet some Persons, not well-affected to the Ordinance of Parliament for the Militia, did, with provoking and threatening Words, discourage them: The Lords and Commons, taking the Premises into Consideration, have thought fit to Order, That the said Persons shall have the Authority of both Houses of Parliament, for their Security and Indemnity for such their so Training already past; and that hereafter they may have a Warrant from the Lord Lieutenant of that County appointed by Ordinance of Parliament, or from some of his Deputies, to encourage them, and to give them Power, in an orderly and peaceable Sort, to draw forth in Companies such as are willing to submit themselves to the said Ordinance of Parliament; and that they and their Officers, in a peaceable Sort, may train and learn the Use of their Arms, at such convenient Times and Places as shall be by them thought fit for that Purpose."